This is the fairing that was constructed in a little over 5 hours! The proud group of attendees did a superb job and redefined what a "hands on workshop is all about!" The following pages hopefully will take you step by step in the process of building your fairing. 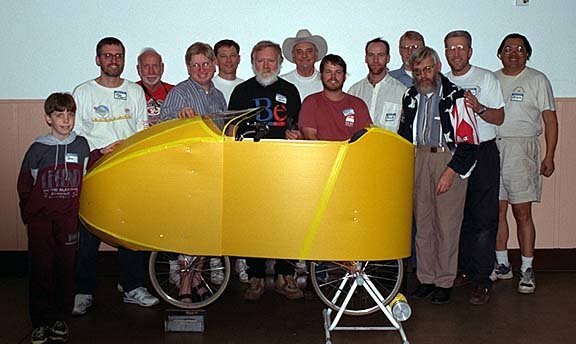 This fairing was built on a V-Rex with 24 / 20 inch wheels and was owned by Larry Varney. Although the fairing is on a short / medium wheelbased mount, the techniques used can be applied to other configurations. I will discuss the possibilities in the summary / conclusion sections after the pictorial pages. There will also be a complete parts list as well as templates for you to follow at the end of these pages, enjoy and remember that it will take you much longer than the 5 hours it took for our students to build this fairing.........but I'm sure you can do it with a little bit of patience........GOOD LUCK!